This page covers the original Premier "Big Red Boats", StarShip Atlantic, StarShip Majestic, StarShip Oceanic and StarShip Royale. It is one of a series of pages devoted to postcards and photographs of the Premier Cruise Line fleet, plus predecessors Dolphin Cruise Line and Seawind Cruise Line. The table below gives links to complete postcard career histories of these four ships. Below the table is a chronological Fleet List showing company and commercial cards of this original Premier Cruises fleet. 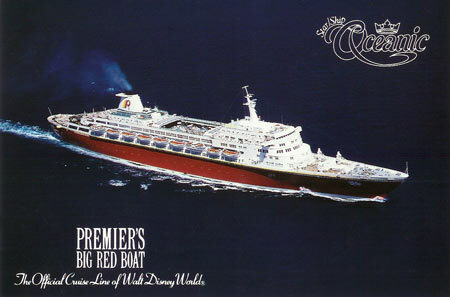 Page 2 covers the 'new' Premier Cruises fleet, formed by the amalgamation of Dolphin Cruise Line (SeaBreeze, OceanBreeze & IslandBreeze), Seawind Cruise Line (SeaWind Crown) and the original Premier Cruise Line (StarShip Oceanic - The Big Red Boat). Page 3 cover the Dolphin Cruise Line. The single ship of Seawind Cruise Line, is covered on this link. Premier Cruise Line was originally formed in 1983 by the Greyhound Bus Company of the USA and cruise execs Bruce Nierenberg and Bjornar Hermansen. The first ship was the Costa liner Federico C, which was refitted and given a distinctive red hull. 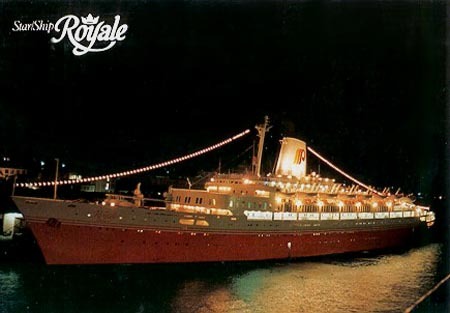 She was renamed Royale, often described as StarShip Royale, and operated 3-day and 4-day Bahamas trips out of Port Canaveral. The second ship, acquired in 1986, was the superb Home Lines flagship Oceanic, referred to as StarShip Oceanic. Subsequent purchases in 1988 were the Home Lines Atlantic, sold by Holland America when Home Lines were acquired, and the Sun Princess of Princess Cruises. These became StarShip Atlantic and StarShip Majestic. StarShip Royale was sold to Dolphin Cruise Line as SeaBreeze in the same year, when these newer ships arrived. The Company was earning in excess of $20 million annually on a gross revenue of $100 million during the 1980's. Nierenberg and Hermansen sold their shares back to the Greyhound Corp ( which had become the Dial Corp) and left the business. SeaBreeze rejoined the 'new' Premier Cruises fleet when it amalgamated with Dolphin. Premier became the "official Disney cruise line", and marketed cruises as part of a package including visits to the Disney theme parks in Florida. This connection was severed when Disney decided to create its own cruise line. 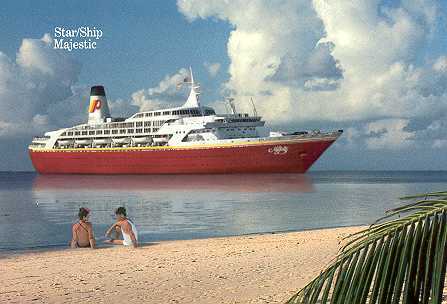 StarShip Majestic was sold to CTC in 1994, becoming their Southern Cross, and the StarShip Atlantic was sold to MSC to become their Melody. This left only the StarShip Oceanic in the fleet before the amalgamation with Dolphin and Seawind to form the 'new' Premier Cruises. Premier Cruises collapsed in September 2000. 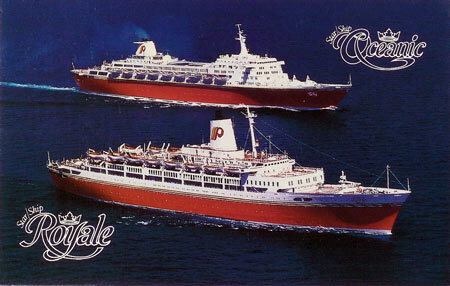 Premier Cruise Lines' first ship was the StarShip Royale, previously the Costa Line Federico C, built 1958. Federico C was the first new ship built for Costa Line (Linea "C"). She worked for them from 1958 until 1983, initially on liner voyages from Italy to South America, and then from Italy to Florida and the Caribbean. In later years Federico C devoted more and more time to cruises. 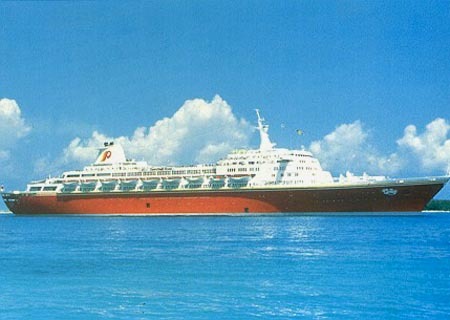 In 1983, she was sold to Premier Cruise Lines, becoming Royale and then StarShip Royale. 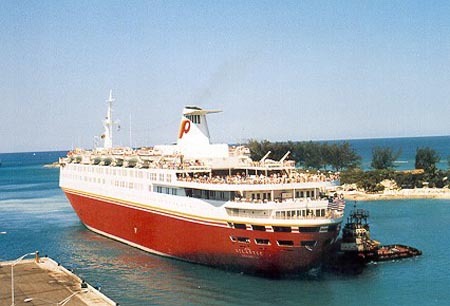 Premier in turn sold her to Dolphin in 1988, where StarShip Royale was renamed SeaBreeze. More recently, both Dolphin and Premier Cruise Lines were acquired by Cruise Holdings, who merged them into an enlarged Premier Cruises fleet in 1997, for whom SeaBreeze continued to operate. In September 2000, the predicted collapse of Premier Cruises occurred. In December 2000, SeaBreeze was reported to have sunk off the US coast in heavy weather whilst sailing light. All crew had been taken off by helicopter. Big Dipper ice cream parlour - Captain Video arcade - Apollo Observatory. Ships Registry Panama. Another Editions FISA card of StarShip Royale, serial number 157a, again using a photo by P.Asenjo. 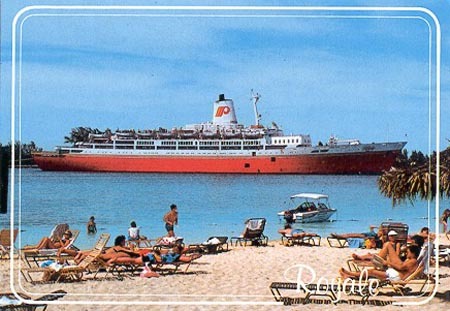 John Hinde Curteich card from the Bahamas, showing StarShip Royale, serial number 2BH 92-B. Two official cards showing both Royale and Oceanic. Premier's StarShip Fleet - the largest and most luxurious cruise fleet in Bahamas cruising. Sailing from Port Canaveral, Florida, on 3-and 4-night cruises to Nassau and the Out Islands. Name entertainment on every cruise year-round. Offering the "Cruise and Wait Disney World Vacation Week," which combines a cruise with a free visit to the world's #1 vacation resort. 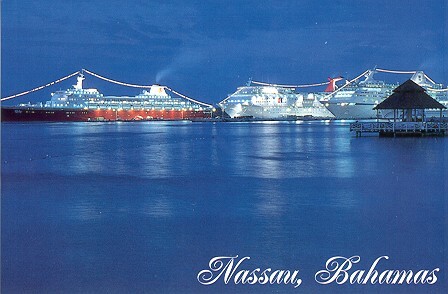 Bahamas Scenic Prints postcard (serial 54-E) showing both StarShip Royale and StarShip Oceanic, at Nassau. Oceanic was originally built for Home Lines in 1965. The Oceanic was completed in 1963 by Cantieri Riuniti dell'Adriatico, Monfalcone. Oceanic was Home Lines first purpose-built ship, designed as a two-class liner to operate in summer on their Canadian route from Cuxhaven, le Havre and Southampton. By the time of her delivery, Home Lines had dropped the Atlantic liner voyages, and Oceanic ran 7-day cruises to Nassau from New York through the summer. In winter she ran longer trips to the Caribbean. She was sold to Premier Cruise Line in 1985, when replaced by the new Homeric. 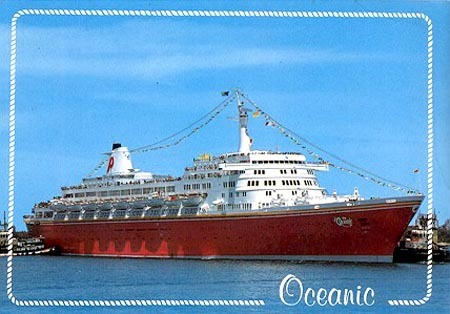 Oceanic became the sole remaining ship in the Premier fleet in 1996, before it was enlarged again following the amalgamation with Dolphin and Seawind in 2000.She was later renamed StarShip Oceanic, but was frequently marketed as the Big Red Boat. This later became her official name. Premier Cruises collapsed in September 2000. Oceanic was acquired by Spanish operator Pullmantur, who had previously chartered the Seawind Crown. 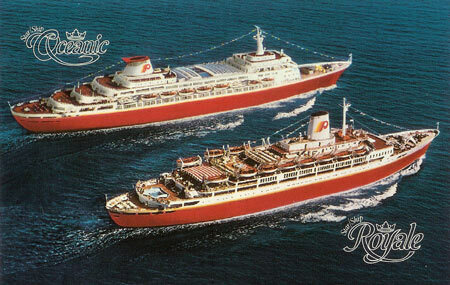 Two Premier Cruises official cards of StarShip Oceanic - The Big Red Boat. Disney Week offers the best cruise to the Bahamas with a Walt Disney World vacation. Published by Editions FISA, Barcelona and using a photo by P.Asenjo. 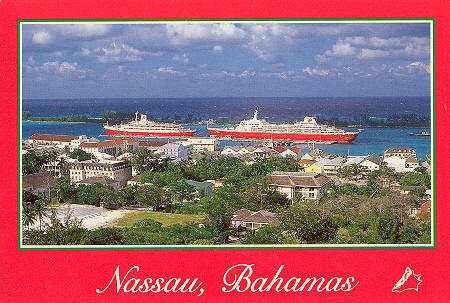 A card of StarShip Oceanic, serial number N683-E, in the Bahamas. 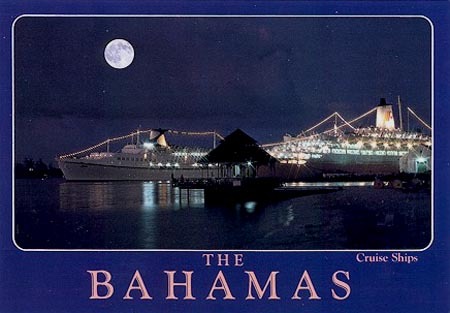 It was published by Bahamas Scenic Prints and uses a photo by John Penrod. Photo by A.O.Wilhelmi 3rd at Nassau. 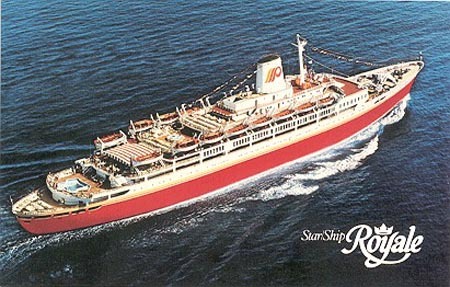 A Premier Cruises official card of StarShip Atlantic, originally the 1981-built Atlantic of Home Lines. 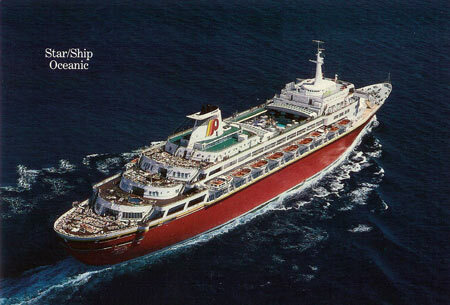 She was acquired to replace the StarShip Royale in 1988, and was sold by Premier to Mediterranean Shipping Cruises, becoming their Melody in 1996. Simplon Postcards sc2023, published October 1992, of StarShip Atlantic. Photographed at Nassau by Wil Moojen. StarShip Majestic was originally the 1972-built Spirit Of London of P&O. Spirit of London was to have been a sistership to Norwegian Caribbean Line's Southward, to be named Seaward. Norwegian Caribbean Line pulled out of the deal after price rises following the Italian builders' nationalization, and the hull was sold to P&O. Spirit of London was eventually completed in the autumn of 1972. When P&O later acquired Princess Cruises in 1974, Spirit of London was transferred to that fleet, becoming the Sun Princess. Sun Princess was sold to Premier Cruises in 1988, becoming StarShip Majestic, one of their "big red boats", and she retained the red hull when bought by CTC Lines in 1994 as Southern Cross. 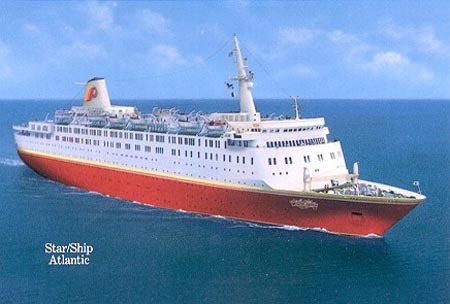 In 1998, she became the third ship in the Festival Cruises fleet as Flamenco. Following the collapse of Festival Cruises, Flamenco was sold for $12.25 million to Cruise Elysia, being renamed the New Flamenco. In 2007 she was sold to Club Cruise for �26 million and renamed Flamenco I. In November 2008, Club Cruise defaulted on their payments and she was sold at auction for just $3.4 million. The card details read:- Premier's Abacodabra 3 or 4-night cruises to 4 magical Abacos Out Islands. Cruise and Disney Week combines a Bahamas cruise with a free Walt Disney World vacation.